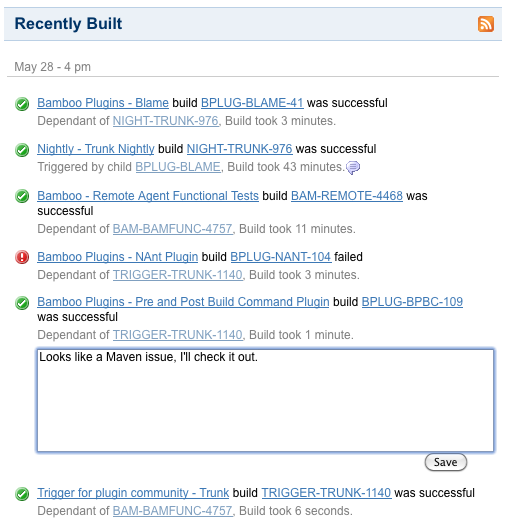 The Atlassian Bamboo team is proud to release Bamboo 2.6. This release brings a host of performance improvements to your continuous integration strategy. Bamboo 2.6 now provides support for up to 100 remote agents and along with several user interface enhancements, you can manage and build many more plans simultaneously from a single Bamboo server. The 'Current Activity' page incorporates several improvements that allow you to manage builds in real time more effectively. You can also comment on build results to record and let others know what might be happening with a build. Imports and exports are now faster, more reliable and require less memory to perform. You can now also selectively choose to expire build logs to help save disk space. If you use Elastic Bamboo, the Bamboo server can now automatically manage your elastic instances. This removes the need for you to manually start and shut down elastic instances, and can help keep your elastic instance usage costs to a minimum. Bamboo also supports continuous integration for Grails projects and can also automatically incorporate Clover code coverage reports into their build results. Upgrading to Bamboo 2.6 is free for all customers with active Bamboo software maintenance. You can download Bamboo from the Atlassian website. If upgrading from a previous version, please read the Bamboo 2.6 Upgrade Guide. Bamboo's scalability has been dramatically increased, now providing support for up to 100 remote agents — up from the previous supported maximum of 25 remote agents. You can now build many more plans simultaneously from a single Bamboo server, with the power of up to 100 remote agents. In the administration console, builders and JDKs are now grouped by their labels. Remote agents are now grouped into separate Online and Offline lists. When specifying the capability requirements of a plan, you can easily access further information about the agents associated with the plan via improved tooltips. To do this, simply click the name of the agent in the tooltip. For more information about Bamboo's pricing, please refer to the Bamboo pricing page. The Bamboo Dashboard's 'Current Activity' page has been redesigned to provide more helpful information and make it much more intuitive to use. Bamboo administrators can more easily administer online agents and the build queue on this page. The new 'Building' section shows which plans are currently being built by an online agent. Each plan's build in this section also provides an estimate of the remaining time required for its agent to complete the build process. The 'Recently Built' section is an 'activity stream' which contstantly updates to show builds which have just completed. You can comment on build results and also set up a RSS feed, to be informed about builds results as soon as they are generated. - Enable or disable online agents directly from 'Online Agents' pop-up balloon (accessible from the 'Building' section). Throughout the Bamboo user interface, plans in a queue are now indicated with a new icon and only plans whose builds are currently being built on a Bamboo agent are indicated with the icon. If a plan's build was not built, the summary page for its build result will indicate this explicitly, rather than indicating that the build had failed. Bamboo Plan Summary pages now obtain data more efficiently and complete loading in much less time. Bamboo Imports and Exports are now more reliable, faster and require less memory. In addition to selectively expiring user-defined build artifacts to preserve storage space, Bamboo now allows you to selectively expire build logs too. Of course, you can still choose to expire all build result data (including build artifacts and logs) too. In Bamboo 2.5.5, we introduced a Captcha feature to help prevent brute force attacks on your Bamboo server. This feature would be activated after a specified number of consecutive failed login attempts. In Bamboo 2.6, this Captcha feature has been extended to cover public signup. If you use Elastic Bamboo, you no longer have to manually start and shut down elastic instances. Instead, you can choose one of Bamboo's new automatic elastic instance management settings to manage the way elastic instances are started and shut down in Bamboo, and to help reduce your elastic instance usage costs. This feature also allows Bamboo to start elastic instances capable of executing plans in the build queue, if no other online agents can do so. These presets alter the values of five criteria (indicated in the screenshots below) that define how elastic instances are started and shut down. You can can also customize these criteria to further fine tune how Bamboo manages elastic instances. Bamboo now provides continuous integration capabilities for Grails projects. To do this, create a new plan or edit an existing one and on the plan's 'Builder' tab, select a Grails builder from the list of builders automatically detected by Bamboo, or you can add and use a new Grails builder capability directly from this tab. 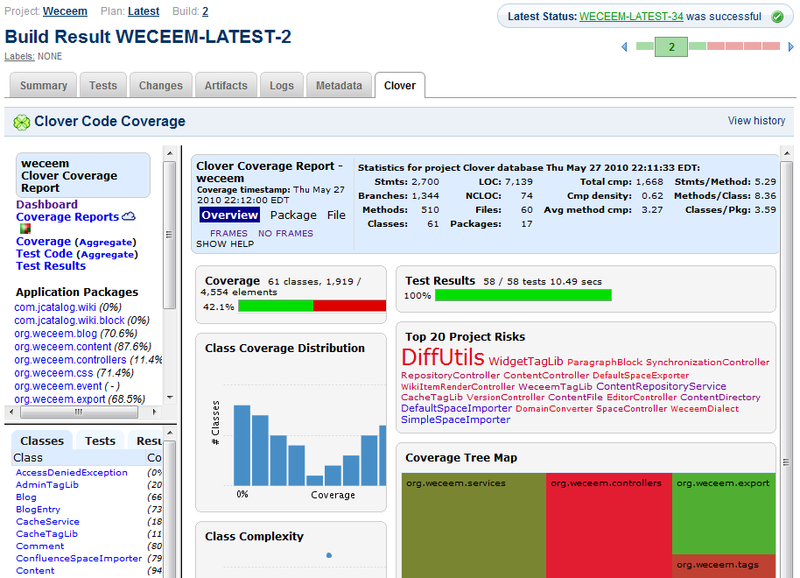 You can also configure Bamboo to automatically conduct Clover code coverage on a Grails Bamboo plan. When Bamboo runs this Grails plan, Bamboo will automatically install the Clover plugin and generate a code coverage report of your Grails build result. Using the Grails Clover feature requires a valid Clover license. Bamboo automatically detects Grails builders based on the value of the a computer's GRAILS_HOME environment variable. 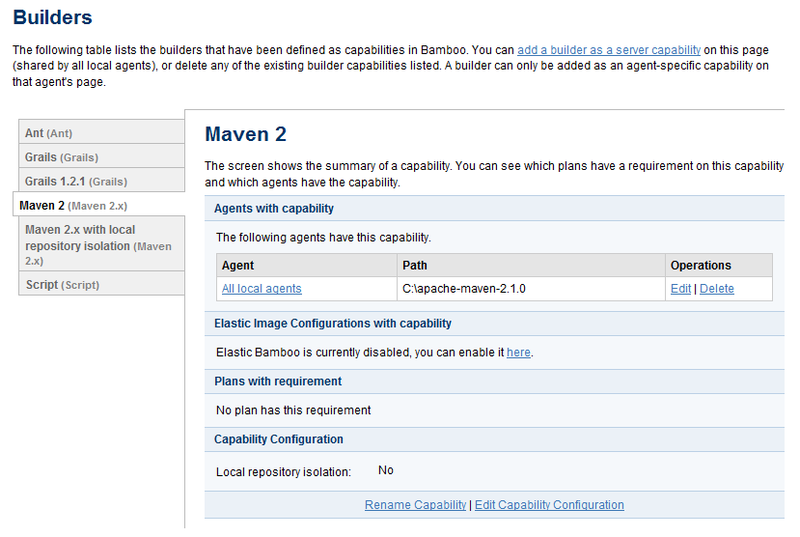 If you use Elastic Bamboo, our EC2 image supports Grails 1.2.1 and 1.3.1 builder capabilities (as well as Maven 2.1).